Haste is a powerful keyword. What makes it important is fact that you are guaranteed to use ally for attack or its ability at least once. This is very good given the plethora of control and burn cards in Shadow Era able to shut down your allies before they get the chance to do anything. 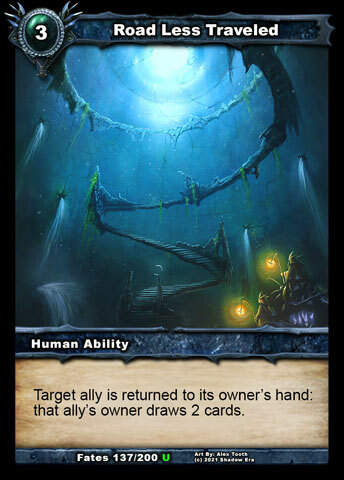 Even if that ally dies next turn you had at least one use out of it, which can put you ahead in tempo more often than not. Boris already used this in DP but now with SF he got some new tools. What did this deck gain from SF? 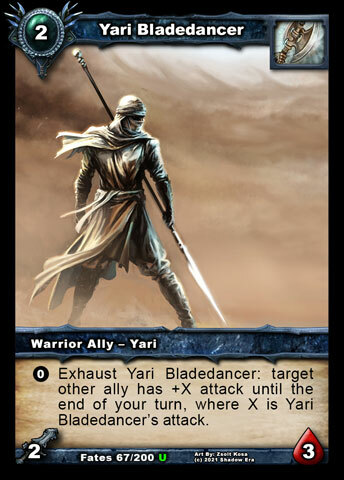 Well first and possibly most important is Yari Bladedancer. He has incredible synergy with hasted allies. Transferring his attack to Viska, for example, will allow you to take down 5 hp ally. If you add attack modifiers to the formula like Aldon, War Banner and Kings Pride even Kris can hit hard up to 9 attack! That kills pretty much any ally in the game. Viska has replaced Wild Berserker from DP. Even though he costs 1cc less and is class specific ally his requirement to gain haste sometimes gets in the way. His low hp also often do not guarantee survival for next turn. Viska on the other hand with her high hp and weapon damage reduction is hard to take down. Add to this unconditional haste and 1cc difference is completely justified even with unique status. Her passive allows me to go bit lower on item destruction. I usually carry 3 Smashing Blows but thanks to her and other haste allies that number can go lower, opening more slots for allies. 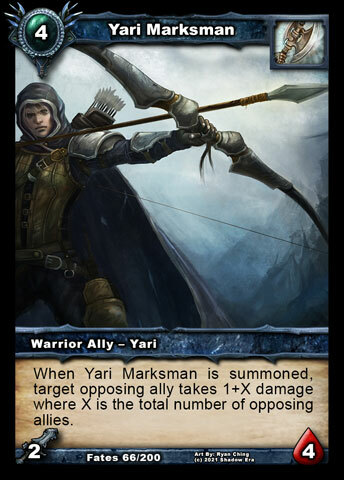 Marksman also allows to carry less ability control cards and instead up the number of allies. Road Less Traveled has great synergy wit haste allies. 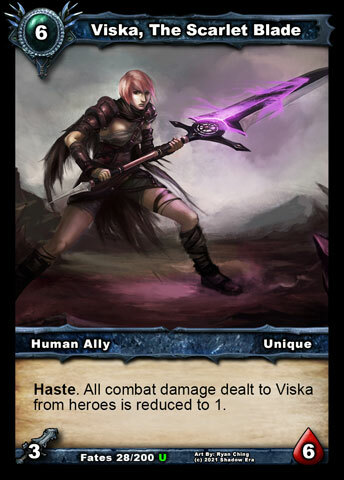 Reusing Kris with KP out to draw more allies with haste is usually finishing blow to opponent. 3 copies of it because this deck requires lots of cards to work. 3 copies of Kings Pride is a must imo. Unlike “normal” Boris where Kings Pride is icing on the cake for finishing blow you absolutely need this armor here because you can’t win by just pining opponent with Kris and FFM. Getting it by T7 is crucial and you need all extra copies against heavy item destruction classes like Priests and Rogues. Spectral Saber is always a nice card to have for warrior match ups. I did consider Eris but she kinda feels out of place here. Seductress similarly to Marksman is control in form of an ally. She helps you get trough game when you don’t have kings pride so your low attack allies don’t take retaliation damage. 1 War Banner as I really don’t think you need more. It rarely gets destroyed, so any extra copy can be dead draw. Deck really plays out itself, but instead of some gameplay advice I am posting a link towards FDL’s YouTube channel. He has match recorded with this deck. One really important thing you must always be aware of is to never waste all of your haste allies without KP in play. That is why I avoid playing Kris until late game. Playing one or two FFM is ok so you can filter cards and set up armor, Aldon and War Banner. But always count how many of them you played so you know how much damage you can produce in following turns. Tagged boris, deck, haste, Shadow era, warrior. Any tips on how to play this deck correctly? After many attempts all I’ve done is fall flat on my face or barely inch the win with only 4-6 health left. From the matvh ups I’ve gone against I just feel the problem is that Boris is way too easily countered. I even lost to a Majiya and she doesn’t even exist in SF. So its a classic opening like with any warrior. Later try to control the board with Yari + other ally/CB ad Marksman until you set up KP. From there on game gets a lot easier and in your favor. In Moostalker heavy meta I would avoid using this deck and Moon’s ability hard counters you strategy. Rest of match ups are winnable and I can’t really think of a bad MU. Its matter of experience how you approach each of them. For example against Tala, Crippling Blow loses a lot of its value as you need to deal with crippled ally eventually because she will use her ability on it. So any ally that doesn’t have damage reduction must not be left on board. Agains Wisp and Sandworm you need to rely on Marskman, and carefully set up the board so you can win it back from her having 3 allies in play. RLT really shines in warrior matches because you get great value out of all your crippled allies as they all have either haste or on summon ability. If she has card advantage like 5 cards in hand and BF on you can freely use RLT on her ally as she will not draw any extra cards from BF next turn. Against Loest/Elad, you need to stop early rush if it is rush build. You can counter rush him better with Kris/Bladedancer/Aldon. Postpone playing BF until T4 or even T5 with CB/BF combo. Keep a copy of BF and all RLTs as Loest will use his ability on BF. Zaladar is easy MU in my experience as they rarely pack LLN so once you get KP out you won the game. Getting Enrage early helps a lot. Lance can be nasty with Eris. At all time have back up BF and don’t sack any RLT. Plan the board so once they play Eris you can counter her with Marksman. If you don’t deal immediately with her you will lose. Knowing how to play against AB is also important and this applies to all rogues. If you didn’t draw Smashing Blow DO NOT attack into it if you have 3 or less allies on board and you can’t win in next 1 or 2 turns. Again RLT is golden here because you can reuse disabled allies. Against Serena specifically don’t play War Banner until late game when going for the kill. She relies a lot on Black Garb and 1 attack Kris and FFM break her strategy easily. If you have questions about some other specific match ups feel free to ask. Thanks for the insight and tips! With a few more plays with different strategies I’ve been having more success! Match up wise theres always having to deal with Banebow or Moonstalker since MS tends to carry an Overwhelm to punish my cripples and Banebow with his ability tends to shift my favor. Other than that I its a pretty solid deck! Thoughts on adding Dragon’s Tooth to deal with fatties? I actually had Dragon’s Tooth instead of Saber lately, mostly to easily deal with Brax Soldier. Key to winning against BB is to destroy WotF asap, even risk losing board temporary for that. you might want to try out gravebone. allies like ironhide karash, infernal gargoyle, eternal troll, phoenix urigon, and dakrath all fit the theme of “really tough to kill” with gravebone’s resurrecting ability.